Having your corporate brand represent your core values is essential to the success of your company, however, too often this critical component to success is looked over. Not so, for the really successful companies, however, like Microsoft, Apple, Google, etc. Such companies will sometimes spend over $100,000 for their logo. What if you could have a logo that not only represented the physical feel of your brand, but also captured the very essence of its value and success through the use of numerology and the ancient tradition of yantra? It all begins with looking at the name of the company to see if it compliments your personal numerology and then designing a logo that incorporates yantra technology. This Yantra Logo to the right was designed based on the opening day and name of a Yoga centre in Taiwan. The analysis of the Centre’s numerology chart revealed an overabundance of the female energy and an overemphasis on love (number 5), which although good from a spiritual perspective is not ideal in practical execution of the mission. To compensate this, I focused on a design that was a little more masculine and had the missing number 4 which is the ideal grounding and planning number. Number 4 is represented by the square and you will see that I have included 4 squares in the design. Along with that, there are 4 earth elements, represented by the circles with a cross inside. The colours of pink and blue harmonise the female and male energy. The overlap of those colours creates a purple which is universally recognised as the most spiritual of colours. I have added the 4 auspicious articles of Lord Visnu and in the centre we have the most powerful chakra, which represents the SUN and is based on the manager’s birthday and, therefore, represents her influence. The chakra will empower the yantra with the pioneering spirit and the power of the SUN to purify and effect changes in the heart. There a 4 tilaks, which represent the divine trinity of Bramha, Visnu, Siva and this triad also represents ultimate stability. The magic sigil to the right captured the secret wish for the success of the yoga centre. You will also note that the geometric shaping of the incorporation date and the name of the centre created a natural octagon in the middle surrounding the Yantra. The octagon represents the number 8 which is “wisdom in action” and, therefore, the number of the executive order or the leader. 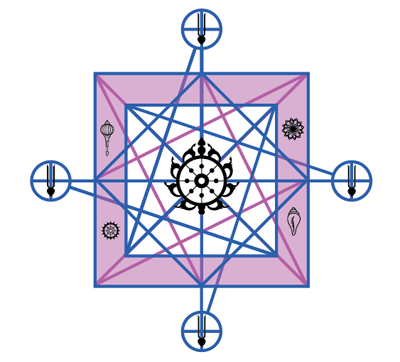 The chakra in the centre of the yantra also has 8 flames. All this is very auspicious for leadership and a successful organisations. Number 8 represents abundance and infinity in Chinese astrology as well. I was very happy with this yantra logo and I feel that it will have a very positive impact on all those that see it. 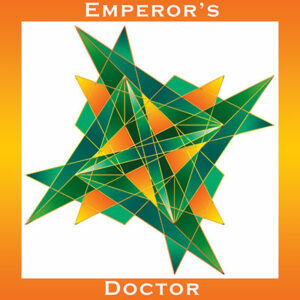 Another example to share is the yantra logo I created for the Emperor’s Doctor Health Centre in Taiwan. The yantra captures an affirmation for health and prosperity and incorporates the healing powers of sun energy mixed with the greens of nature. You will receive a high-quality digital file for printing. YES, I WANT ONE NOW!